Wrong place. Wrong time. Again. First Contact: RT ’73 Special then the novelization, which intrigued. Finally the BBC2 '92 repeat, which entranced. The Lowdown: World, or dream, in a bottle-it’s a sideways glance into elsewhere. Look Mum, no face! We’re all fiction now. Pre-ramble: Upper echelon. Generally fondly thought of I think, have seen the occasional diss. 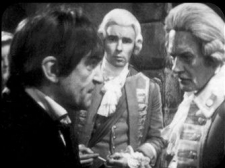 Troughton, Hines and Padbury make a great, great team. 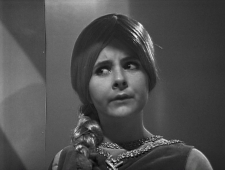 I love the initial scenes as the lava advances on the TARDIS and their differing reactions: Zoe and the Doctor’s scientific fascination, Jamie’s open panic. Derrick Sherwin is channeling David Whitaker in excelsius with the fluid links overloading. 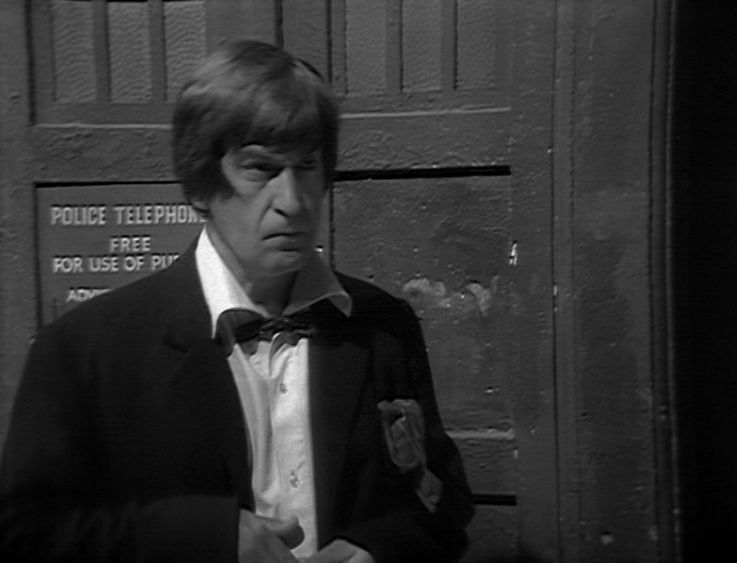 It’s all very tense, eerie and suspenseful from the start with the Doctor seeming genuinely fearful of the consequences of using the ‘emergency unit’. It’s mega tense (technical term) when Jamie literally forces his hand and the electronic sound is wonderfully atmospheric. Troughton portrays fear so well and his concern at being ‘nowhere’ is well spooky. 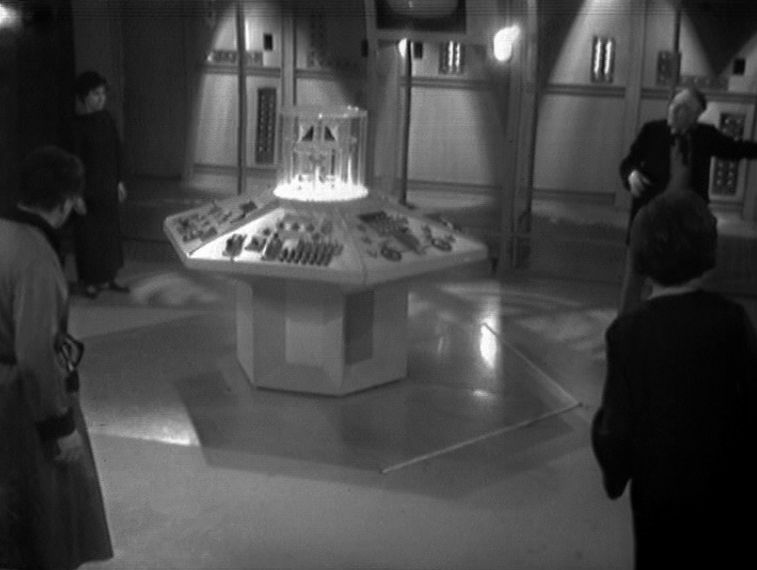 It’s also interesting to see a little more of the TARDIS in the form of the power room. (Well off point but this has got me thinking about that unused 80’s script about the parasitic entity at the heart of the TARDIS.) As Jamie and Zoe both start to hallucinate pictures of their homes on the scanner things remain well eerie. When Zoe ‘disappears’ into the mists outside it’s simply but effectively done. I like the cut to the scanner blanking as she vanishes too. 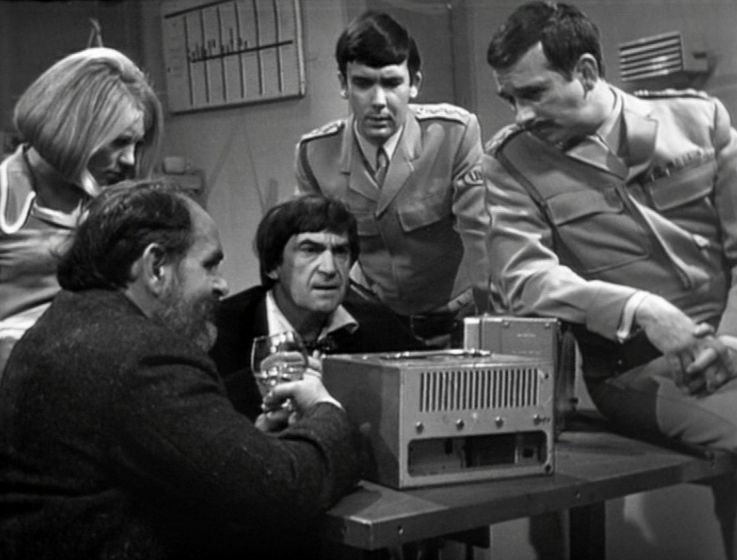 As the TARDIS emergency unit begins it’s warning the atmosphere continues to build steadily. As the second, alien sound begins to invade the TARDIS and the Doctor collapses into the chair you really are wondering what the hooting heck’s going on. Gripping in a word. The void outside turns out to have a clear studio floor line but this is utter, petty quibbling. This is way brill. I love the burbling, warping electronic noise for the White Robots-they really work, despite being borrowed from ‘Out of the Unknown’. As with so much of this adventure, the production crew making a virtue out of necessity. It’s hilarious when Zoe slaps Jamie back to reality-Hines looks like he felt it! The bleached out, photo negative Jamie and Zoe are also good and disconcerting. We’re all tripping now Mum! 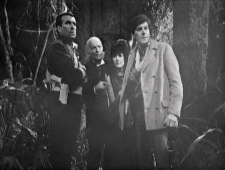 The crew appear to escape back to the safety of the TARDIS. Is it all a dream/mental adventure? ‘All that we are and all that we seem is but a dream within a dream’ to misquote Poe via ‘Picnic at Hanging Rock’. There’s great, sinister use of sound in this one as the alien vibration begins to reverberate around the console room. Exterior shot and then the blummin’ TARDIS breaks up! Just WOW. So surreal. So spooky. So gratuitously lingering on Zoe’s arse. 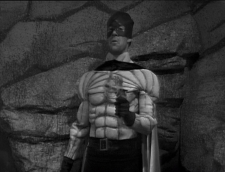 A definite contender for best individual episode of ‘Who’ ever. 13+++ with honours. 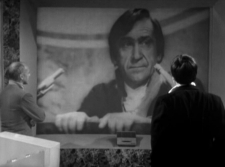 Awesome.Troughton owns the screen. The TARDIS console spins away into the mists. I think this is one of my first memories, as a recurring nightmare! I’d’ve been knee high to a grasshopper but me grandfather was a fan (it’s in the genes) and I was apparently plonked down in front of the set. Oh but the forest of words is beautiful-ladies and gentlemen, I give you ye dark’n’psychedelic fairytale. 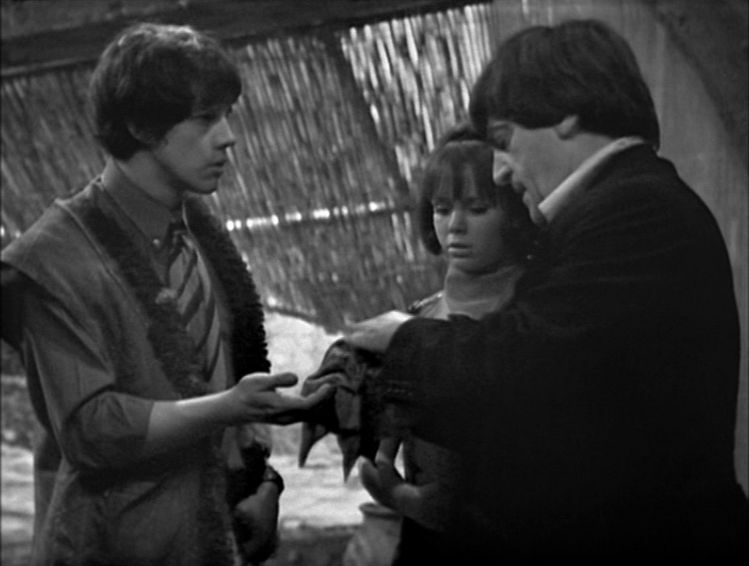 Jamie loses his face and becomes temporarily two dimensional-the production working around real life problems (Frazer Hines’s chicken pox) with real ingenuity. Could’ve easily just written him out for a couple of episodes but turns it into a major plus instead. It’s a great script from Peter Ling, he can literally do/utilize anything, FX and budget limitations allowed for! We get our first glimpse of ‘The Master’ (no, it’s another one) at the heart of things and he’s very Padmasambvah from ‘Abominable Snowmen’ with the alternate smooth and harsh tones. 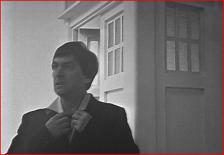 As he begins to explore his surroundings Troughton is just transfixingly magical. 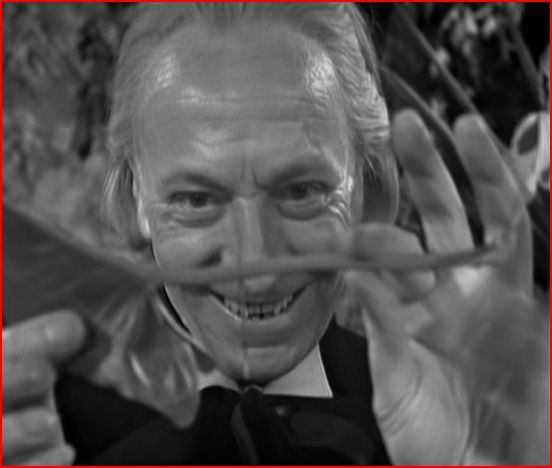 Yes, I am biased, he is my favourite Doctor but fey whimsy with dark undercurrents has never been bettered. I’ll say it again: Transfixingly magical. 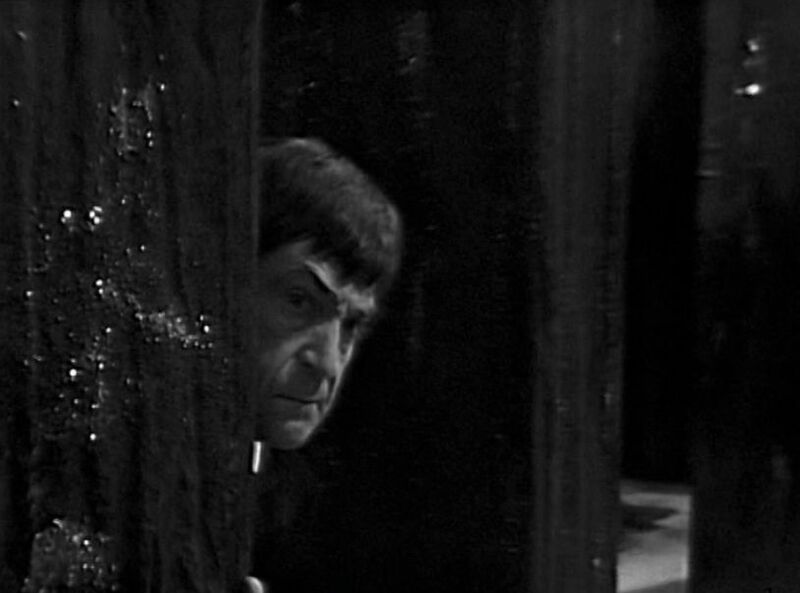 Random note but it’s gotta’ be said this episode features the creakiest creaky door ever.Nice. 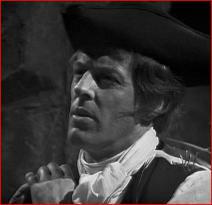 Bernard Horsfall is great as Gulliver-it’s genius having him only speak lines written for the character. Troughton and Horsfall play off each other superbly. I find all the word’n’mind games quite enchanting, in no way tedious. The child actors are great, especially the smallest girl (Sylvestra la Tozel?) 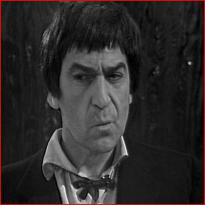 who Troughton seems to take to. Hamish Wilson makes an interesting ‘alternative Jamie’. Can’t replace Hines but his is an engaging, slightly lower key interpretation. (Would’ve been fascinating if Hines had left to replace him like this-a companion ‘regenerate’.) When the Doctor and Jamie rescue Zoe it’s charming then hilarious with the Doctor’s embarrassment at getting Jamie’s face wrong. The forest of words is great from ground level, the overview not quite so breathtaking. It’s sublimely daft when the TARDIS crew try to hide from the clockwork soldiers: ‘The letter J, there’s room for two! Oh good, a C!’ The echoing creak for the soldiers’ movement is extremely eerie. The general unreality vibe is still extremely disconcerting at this point, Gulliver unable to see the soldiers as to him they don’t exist and neither of course does he, nor (oh woe!) 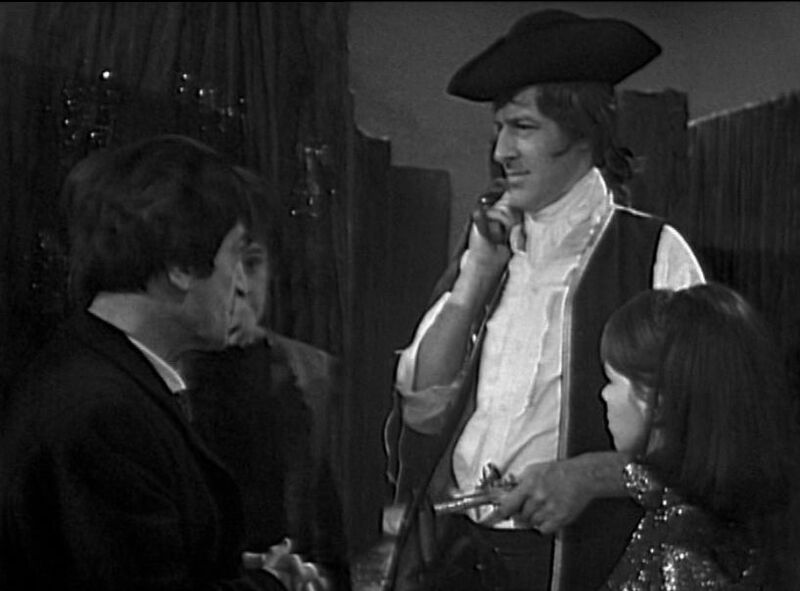 the Tardis crew and of course I’m really typing this…Caught in the self reflective hall of mirrors indeed. And the cliffhanger’s not bad Mr.Maloney sir, not bad at all. The Unicorn is clearly a painted horse with a horn stuck on it’s bonce but yeah…just gets away with it. Despite occasional obvious budget limitations, 13+++ again. Such imagination (literally!) on display. The Doctor halts the Unicorn charge with the power of will over all-existentiality ahoy! Lawks. I love all the 3D to 2D stuff, would make a good attack mode for a modern villain come to think*. 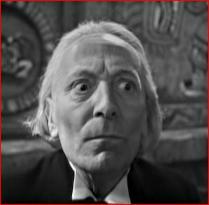 Emrys Jones’s Master is never mega threatening but does remain quite eerie and spooky. And I love that good old Doctor-Zoe banter, especially when she realizes he got Jamie’s face wrong. 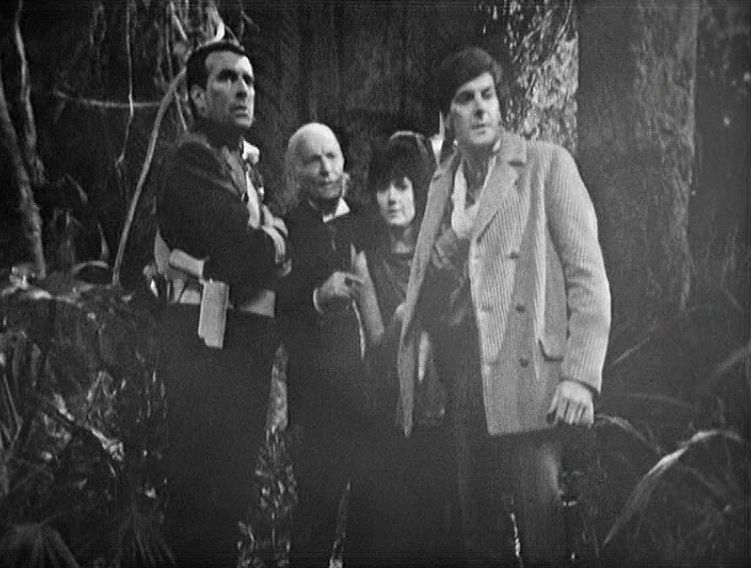 As the trio begin to explore the ‘house’ it’s so casually but startlingly surreal as they instantly find themselves in the maze. Very dream sequence. 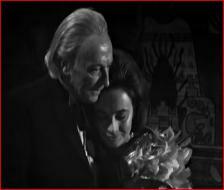 Is the Master an aspect of the Doctor, the whole thing his own dream? The background hum’n’chatter, the almost human ‘hum’ is interesting. I know it ultimately (apparently!) turns out to be ‘Super Computer’ but I’d have happily gone with more organic ‘Mind Gestalt’ as with the Xeraphin/Fendahl. H’mm…The atmosphere throughout the maze scenes is great, a rollicking good yarn indeed! 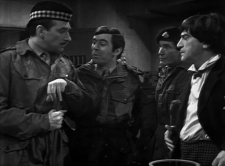 The Troughton and Horsfall exchanges are again quite charming, they’ve both got such presence. 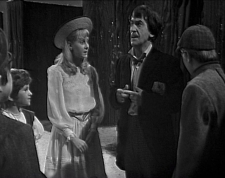 As the Doctor explains the fictional ‘reality’ I love his expression and virtual look to camera as Zoe asks ‘But why are we here?’ Lovely, sly pushing of ye old fourth wall. Deft. At the citadel I like Christine Pirie as Princess Rapunzel and Frazer Hines is on sparkling, flirtatious form. 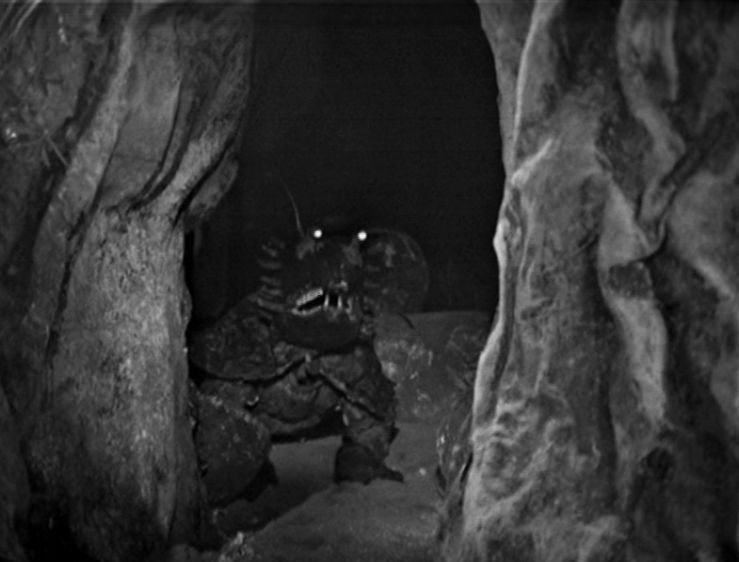 Back in the caves I find the Medusa well eerie and there’s some nifty pioneering use of stop motion technology. As she reaches for Zoe I find it a strong, tense cliffhanger. 13+++ again innit? I like the inter-textuality of Jamie not believing the Doctor would use a sword, ‘cos our Doctor never would, would he? 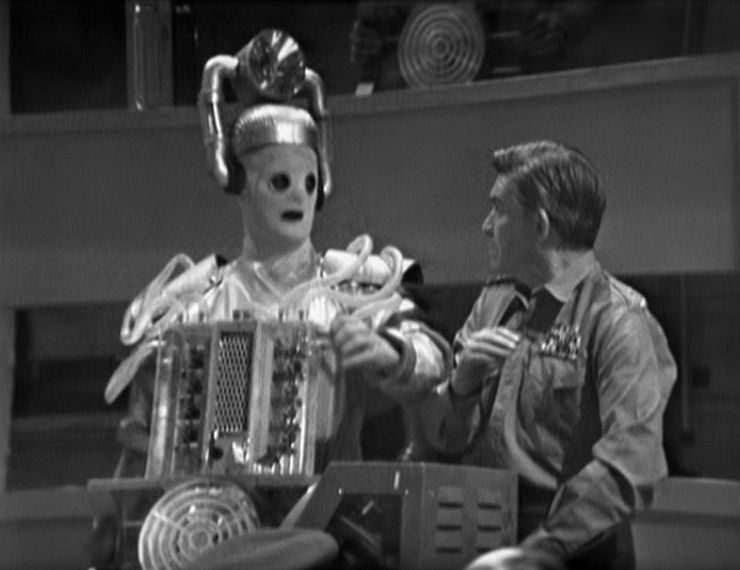 The White Robots really work for me, supremely eerie in the same manner as the Clockwork Soldiers. There’s a grim irony to Gulliver’s observation that liberty is altogether impossible as he himself is entirely fictional. Then we get Zoe’s fight with the Karkus (Christopher Robbie.) This whole sequence is complete arse and probably the weakest in the story but…they just get away with it because of the ‘it’s all fictional anyway’ schtick. Very funny. 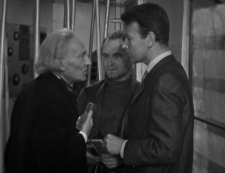 Also interesting that the Karkus was a danger because the Doctor didn’t know of him. So ‘knowledge’ is reality? As Troughton bluffs his way into the citadel with cod German it’s a brief return to his earlier, comic persona circa ‘Highlanders’ and ‘Underwater Menace’. 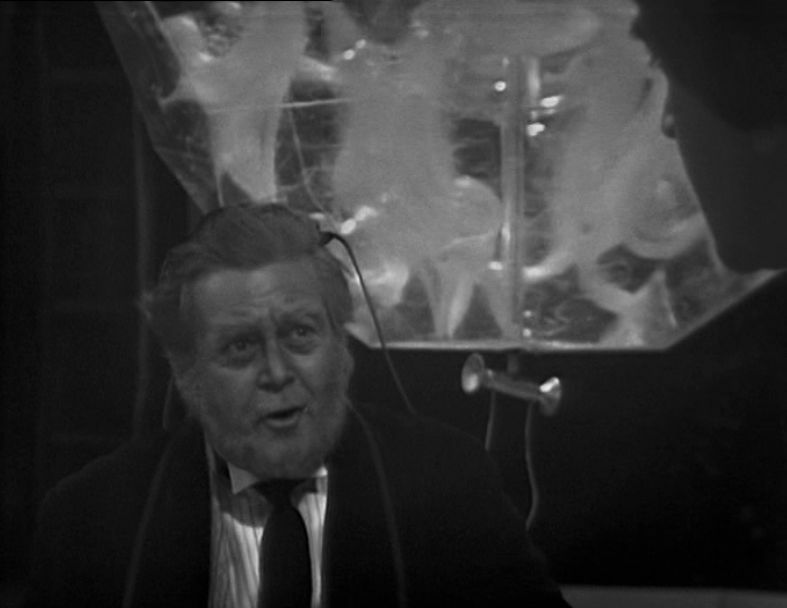 Horsfall’s Gulliver is just endearingly hilarious, thinking it may be the Yahoo’s threatening the time travelers. 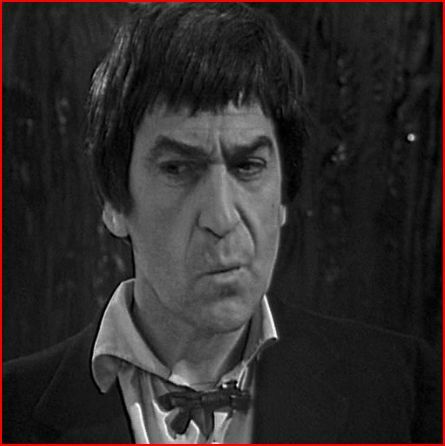 When the Doctor’s humouring Gulliver Troughton has a lovely, gentle touch. 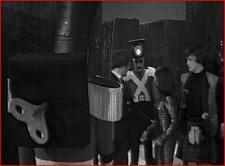 As the Doctor’s party arrive at the centre of operations it’s a great build up as they walk into darkness. The nature of the ‘Master Brain’ is curious and left ambiguous-I know they seem to go with computer but it looks a mix of electronics and living matter. 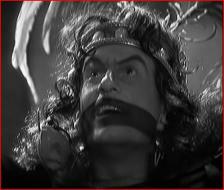 It’s all very ‘Wizard of Oz’ with the Master as the fumbling operator/servitor. And again, with his talk of dozing off over his desk in summer 1926, I’ve got to wonder if it isn’t all a shared dream? Apparently creative energy keeps this world going-we are what we know/we know what we are. Bugger but this one’s deep. 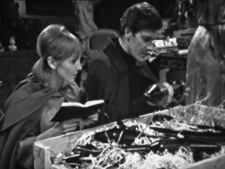 As Jamie and Zoe explore the library the production’s doing it’s damndest but I wish they’d had some ‘Silence in the Library’esque CGI available to them. Although that said, the black and white era stories have got a unique atmosphere in and of themselves, because and in spite of their limitations. The Master talking of the ‘intelligence’ he serves makes it sound like one of ‘Who’ s extra-planar bods: An Animus, Toymaker or Great Intelligence. 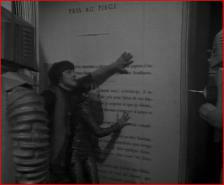 And it’s a genius cliffhanger with Jamie and Zoe getting squashed within the pages of the giant book. 13 this time, it slips just a little (Super Computer? Bah! Humbug!) but still brilliant. 18 minutes?! Crimminy but these episodes are getting shorter and shorter. Although I’m not holding it against ‘em, they work by crikey. 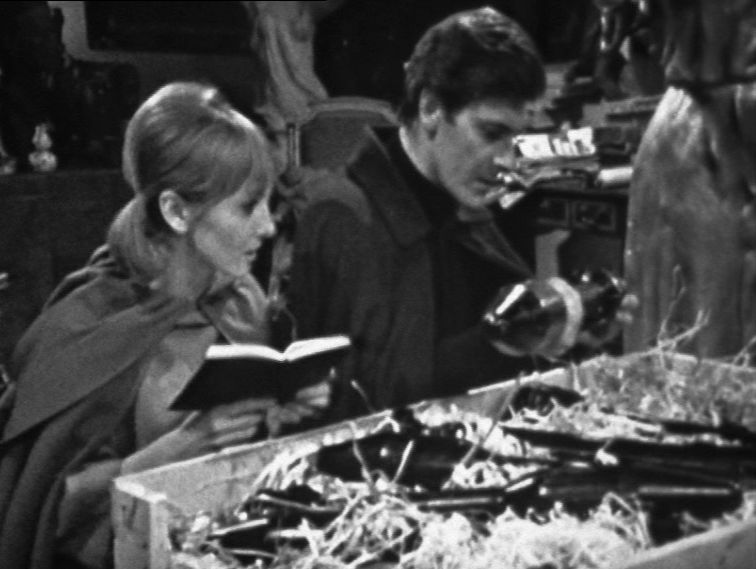 Troughton is afforded some great gallivanting about the place, disappearing up the bookcase. 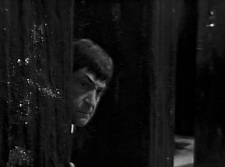 I like the background noise/chatter as the Doctor emerges on the roof of the citadel-the Master Brain thinking out loud? As previously rambled, just wish they’d left it more organic than computer. Christopher Robbie is again hilarious as the Karkus and Christine Pirie is lovely as Rapunzel, consenting to let the Doctor climb her hair even though he’s not a prince! Hines and Padbury are fantastically sly and malicious as the controlled Jamie and Zoe, trapping the Doctor in the false TARDIS. And then it’s revealed that the Master Brain has designs on Earth…What?! Why?!! The story really doesn’t need this, so surplus. 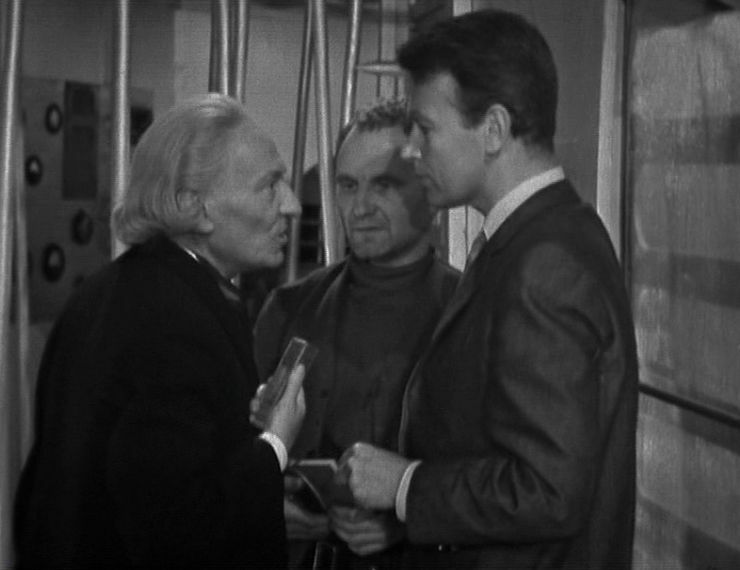 Do like it boiling down to a battle of wits between the Doctor and the Master, the self is reality. And I love Troughton urging Jamie and Zoe to forget fiction and hold on to real life: Impassioned double ironic meta-textuality. Nice indeed. Again, kind of wishing they had the budget/CGI of today for the final fictional face offs but it’s all fair rollicking. Admittedly it’s an uber cobblers ‘Press every button & blow everything up’ ending but it remains superbly eerie and atmospheric in the final moments. It’s wrapped up but by no means certainly or neatly. Wherefore next indeed and what of the Master? Perchance to dream! I’d say 13 here, it slips just slightly in the latter stages. But for the sheer verve, imagination, boldness of some of the imagery and genius in making a virtue out of necessity…13+++ with knobs on! *Yerse, hulloo 'Flatline'- kinda' blowing the gaff that I originally wibbled this one back in 2012! Both significant in being the first story for our first new Doctor and game-changing in that it's the first time the stunt's been pulled. Plus outstanding into the bargain. One of the genuine contenders for 'Greatest TV 'Who' Ever' and it doesn't exist bar scant clips. Not entirely sure it was well served by a mildly rushed animated version but nice to have all the same but heck...Somebody find the film cans in a Ghanaian/Singaporean/Venusian broom cupboard post haste innit Reverend? Now this is the first of a very meta-significant Season 5 triptych. Significant for being the missing episode poster boy up unto its late '91 discovery, early '92 reveal and...It's really not all that. Died in the wool Troughtonite that I am (It's kind of like a horizontal stalagmite/stalactite, you'll find me jutting out of a rock surface at Wookey Hole) I can't find it in me heart to mega-big this. Some wonderful moments, as illustrated above, first half a lot stronger than the second but really stands as a testament to 'The Memory Cheats/Careful What You Wish For'. And again with the meta-significance but some added outstanding. The sleeper hit of Season 5/Troughton's tenure, a bit of a stealth stunner whose reputation was growing inch by inch, to utterly ace it on discovery...Expectations can be exceded and then some. Interesting also in some of the Bondian tropes David Whitaker is playing are really stretching 'Who's' tea-time format (the episode 2 infiltration shenanigans with Jamie are particularly inept/kiddy-land) but stunning overall nonetheless. Whereas this truly is a timeless, magical, otherworldly, outstanding stunner. 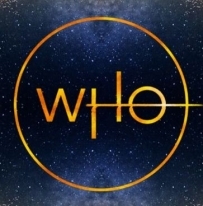 'Who' making a massive virtue out of necessity following the collapsing acrimony of the previous story, a sly fairy-tale for the dark ages to come and then some. Mass Production. Repeat. Fade Out. Hugely significant for the introduction of UNIT proper. A format that's gonna' serve the next era majorly and recur throughout 'Who's' history so I'd say quietly game-changing (in advance of the full monty) in and of itself. 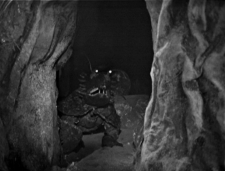 'The Krotons'?!!! What are you on Gantry? Well dodgy monsterdom? 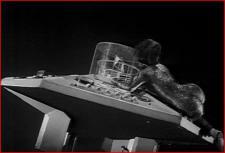 Er, no, the Krotons are superb and long overdue a budgeted up TV return in me humble. Go on Chris...take Jodie back to Gond World! The budget and some (some, not all!) wooden performances cause it to slip and skitter uncertainly, direction point indeed but...Bob Holmes. Massive significance for the first TV credit for a writer who'll cast a looooonng shadow over 'Who'. In a good way for meself, shadows are good. Plus well eerie soundwork, occasionally inspired direction from David Maloney and, as said, a conceptually uber-great foe...Significant factors transcend the scantness Reverend. Significant as another Doctor bows out and we also don't get the on screen reveal. 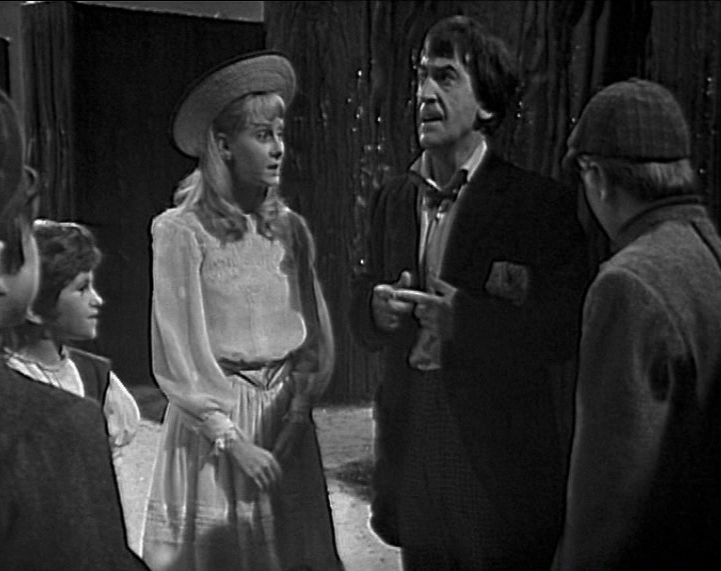 Very spooky, downbeat ending actually...But absolutely game-changing in introducing the Doctor's own race, the otherworldly and currently deeply sanctimonious Time Lords. Absolute magic from start to finish, a bravura showing from messrs Ringham, Hill and Hartnell but everyone is on good form. A story that makes me proud to be a fan and one I'd be proud to show to anyone with sufficient attention span, oh yerse. First Contact: RT ’73 Special then a ropey copy of a copy. The Lowdown: Can you change history? With a liberal sprinkling of human sacrifice. 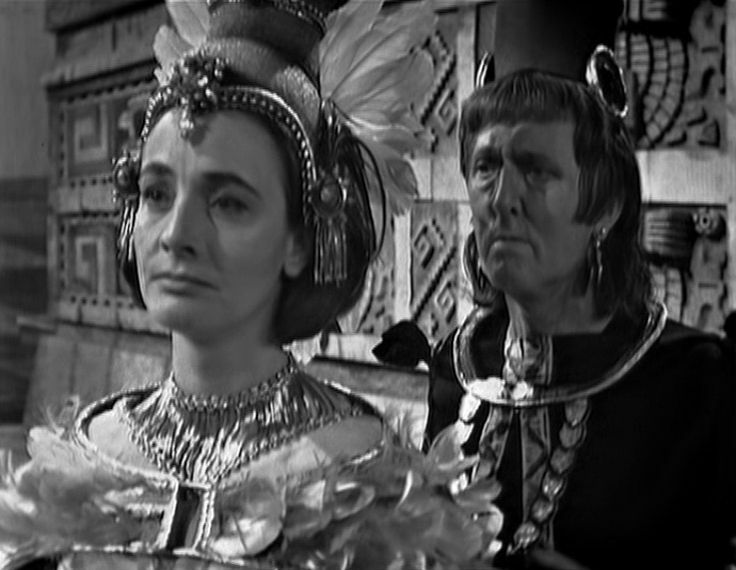 I mean, yer, it’s a bit of an evil caricature but boy does John Ringham stand out as Tlotoxl, High Priest of sacrifice. Arrestingly brilliant stuff. And I don’t think Tlotoxl is really any more of a believer than High Priest of Knowledge, Autloc (Keith Pyott.) He just plays the system to his advantage. Ian Cullen is great as Tlotoxl’s bloodthirsty aide de camp Ixta and makes a strong impression as well. Keith Pyott is a very difficult one to assess-he seems a tad fumbling/bumbling on occasion but it’s probably characterization! It’s a simple situation and dilemma, lyrically written: John Lucarotti and script editor David Whitaker are on fire here. There’s great resonance and tension from the off, with Barbara having to keep up the pretence of being the divine reincarnation of Yetaxa. She’s horrified at the contrast between the gentle Autloc and butchering Tlotoxl but it was ever thus innit? A story for the ages. With a great, eerie’n’ominous score from Richard Rodney Bennett. He does go a bit overboard on ‘ominous glockenspiel’ but it’s darn good. An easy 13++. Crimminy but this is good; probably the best ever episode of classic ‘Who’ in what’s arguably the best ever story, period, old and new. Tlotoxl continues to be a wily old snake, manipulating the Perfect Victim into doing what he wants here and ultimately he’s gonna’ win through. The educational remit is horrifically blunt here, Barbara warning Autloc of a future of 10,000 sacrifices in one day. 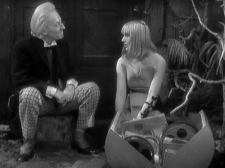 Although there are subtler, more pleasant strokes: The Doctor’s delightful, very natural feeling flirtation with Cameca and his backgrounding as a ‘scientist and builder.’ The engineer coming through at Sydney Newman’s behest, unaware of how much it would feed in to the future mythology. The Hartnell-Hill scenes are absolutely electric here: Her breakdown in the face of his anger, his abrupt and heartfelt apology. It’s one of their best, if not their best ever scene together. But the other regulars are on great form too. 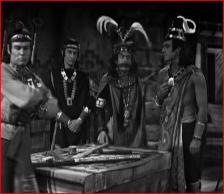 William Russell’s in very fine fettle, love his subtle mocking of Ixta and Autloc’s bemused observation that the Aztec warrior was defeated with a thumb. Great line. 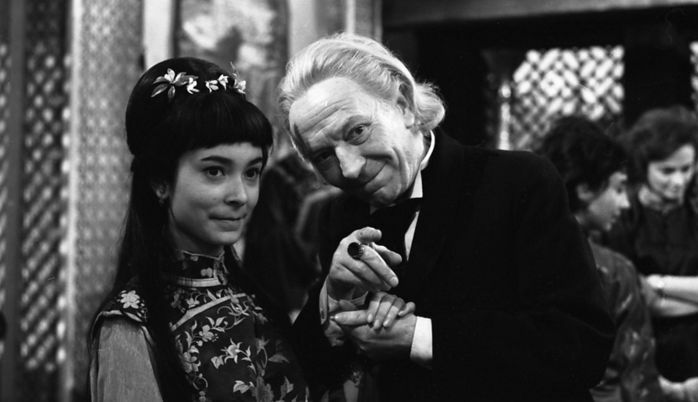 Carole Ann Ford’s great’n’all, even if she has more limited screen time in the middle episodes due to a real life break. 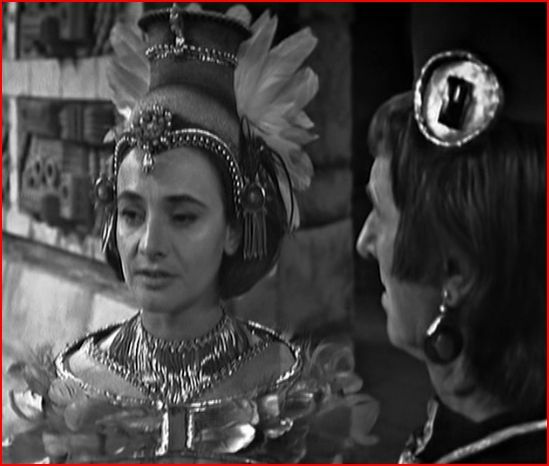 Cultural Relativism (deservedly in this instance for meself) departs over the horizon with its arse on fire as she shouts Autloc and Tonila (Walter Randall) down over the idea of arranged/enforced marriage. Yeah, I love the interweaving plots, the Doctor not realizing he’s aiding Ixta against Ian with his knowledge of ‘horticulture’. The fight scenes are good and it’s generally strong direction from John Crockett again. Ian’s definitely been in the forces at some point hasn’t he? But no, 13+++ with knobs on again. Brilliant, brilliant stuff for me. Seeing how much of the 60’s stuff we’re missing it’s a true wonder all of this one survived but thank goodness it did. 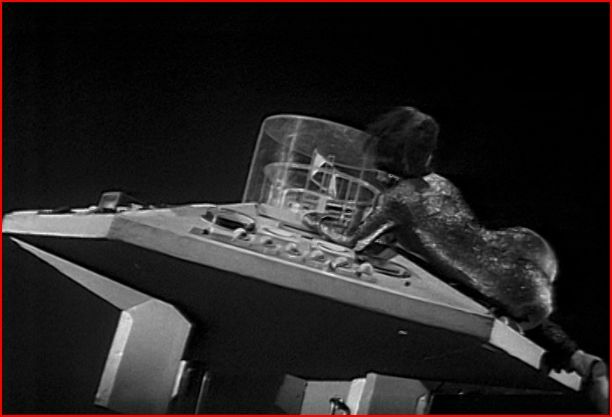 Gotta’ say it again, great design and sets from Barry Newberry. I like the continued bigging up of the culture clash, with Susan sticking out like a sore thumb. 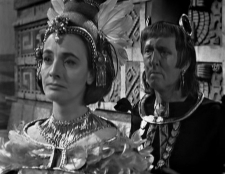 The gap is played so excellently, Susan denouncing the Aztecs as ‘monsters’ and Autloc near physically recoiling. Also the quiet bravery and dignity of Autloc, willing to support Barbara at the cost of his own position. 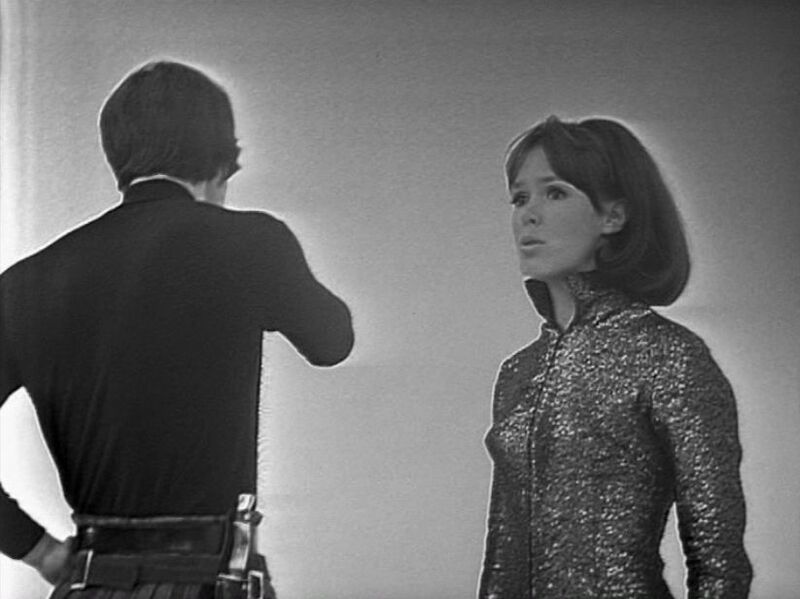 It’s another great moment when Ian highlights him as the odd man out to Barbara. It’s very powerful when she breaks down at the situation she’s got herself into and Ian does his stiff upper lip best to reassure her. Very human vulnerability in the face of Tlotoxl’s politicking. The Doctor-Cameca scenes are sublime, Hartnell’s on stunning form. Although he’s also great with Tlotoxl, treating him as if he’s swatting away a fly. The accidental acceptance of Cameca’s proposal is just genius’n’charming, Margot van der Burgh is quietly great. Hartnell’s face when he realizes what he’s done is one of the classic moments. Love Ian’s amusement and congratulations when he finds out what’s happened. Lovely stuff. 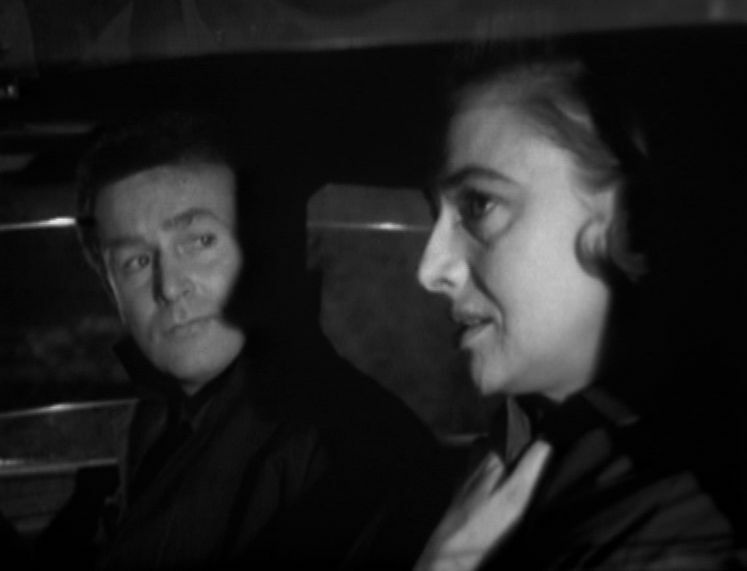 Admittedly there’s some timeless ‘polystyrene slab’ acting from William Russell and Ian Cullen but nah…This is dark, thoughtful and adult with several delightful laugh out loud moments along the way. I adore it. Not quite up to the giddy heights of the second episode but still uber banging. Another easy 13+++. I do wish they’d kept individual episode titles into the Tom Baker era-‘The Day of Daftness’ would be perfect for ‘Horns of Nimon’ 2 but anyroad…This is probably the weakest episode. It’s stringing it out now but it’s some of the most elegant stringing out ever. Bloody and horrific yet weirdly beautiful, this world is as alien as any of the planets the TARDIS crew have landed on. More so I’d say. But also so petty’n’human’n’real: Susan had up for transgression of the law, Ixta gloating over Ian’s (supposed) death. 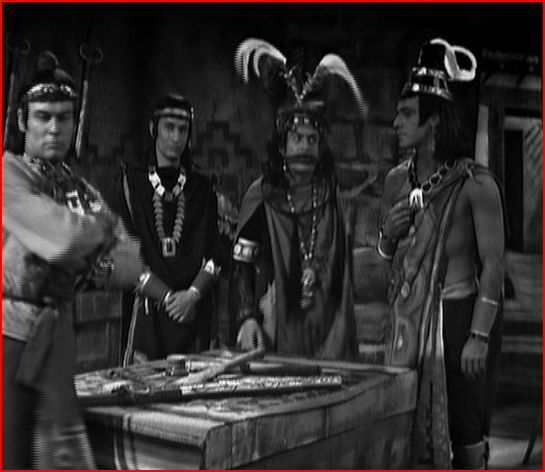 I do like Ian’s final squaring off to Ixta in full eagle regalia. Way cool Mr Science Teacher. Cameca and Autloc are left bereft and not knowing what to think anymore. 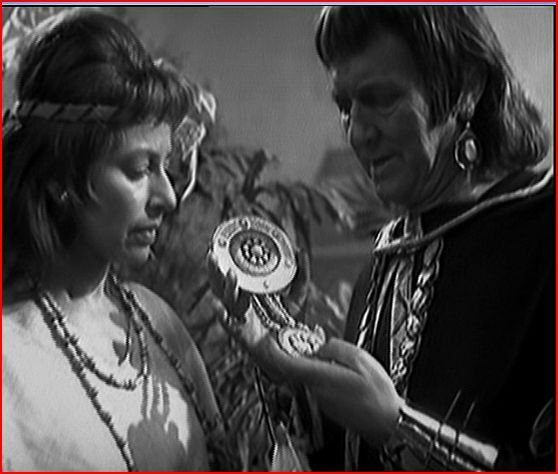 Cameca’s ‘think of me’ to the Doctor is truly poignant, as is his inability to leave her brooch behind. And also quite chilling as he’s leaving her to the tender mercies of history, as with Anne Chaplett in ‘The Massacre’. Lucarotti doesn’t call him out on it here but will do in the latter story in some style. There’s slight dissonance. Barbara seems abruptly jollier about the ‘don’t interfere’ vibe, then wretched about Autloc. But things are tidied up efficiently, the travelers collecting the Doctor’s anachronous pulley and rope on the way out. No rewriting of history here and Tlotoxl wins out! I’d say 13+ here but 13+++ overall. Lovely, poignant stuff, largely carried by the strength of the script and acting. It’s difficult to find an all out diss. The Ratings Guide is overwhelmingly positive, with one anti review sticking out like a sore thumb: As with ‘Running Through Corridors’ it singles out the time travelers treatment of Autloc and Cameca as exploitative. H’mm…Means to an end in desperate straits and double poignant because of it for meself. No,it doesn’t sit totally easily but works because of that for me. The ‘black hat’ contingent are drawn in pretty broad strokes but nah…I’m with the ‘Discontinuity Guide’, a ‘gem to cherish’ indeed and for me another contender for the ‘best ever’ crown. A) Significant : Maybe it's an important character/foe/location, something, somewhere, someone that'll be returned to more than once. B) Game Changing: Okay, yeah, similar to A but this goes quite massive on the actual mythology/background/base style of the show and really alters/rearranges things. C) Outstanding: Immensely subjective I know. 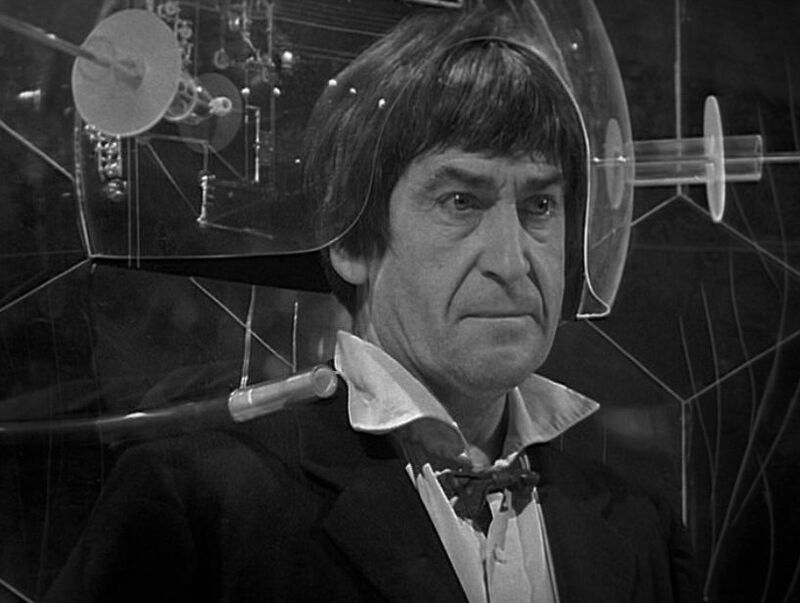 There may be little that's groundbreaking but I personally think it's an astonishing piece of 'Who'/TV in and of itself. Subjectivity all over the shop granted. I know it's become quite common of late to divorce the first episode from the next three, stellar opening plus 'Caveman Runaround' but I think it does the whole a disservice. Obviously significant as the first ever story, without which I wouldn't be wibbling now. But it's a superlative intro from messrs Whitaker, Lambert, Hussein, Newman and Coburn behind the cameras, Hartnell, Russell, Hill and Ford in front of them. Both significant and outstanding. 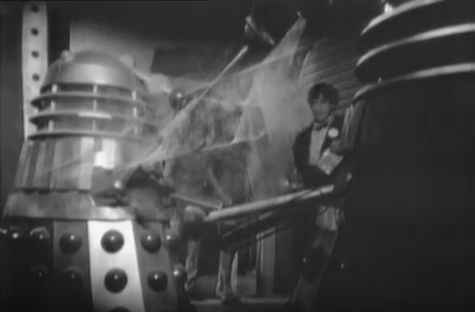 Yep, it's a teensy weensy bit overlong but hugely significant for the introduction of the Daleks and Terry Nation's is a name that looms large in the history of 'Who', whatever your take on him. (To go off at an utterly random, Joy Division tangent, Nation is kinda' the Tony Wilson of 'Who' for meself, which is to damn neither with faint praise. Geezers.) Significant and then some. Again, yeah, it falters and fumbles, the core cast by turns stunning and stumbling but extremely significant, perchance a little game changing in being the first story to hint at some form of consciousness for the TARDIS itself. Meta-significance all over the shop. Here by virtue of being the first (and completely at that) missing story. Which has turned into a cottage industry/rumour mill to outlast the ages. So significant (in an unfortunate way) and likely outstanding if it's ever discovered. I just think this is a thing of utter, savage beauty. Hartnell is awesome but Jacqueline Hill owns the screen. You go (and then some) big-cardi girl. Outstanding. 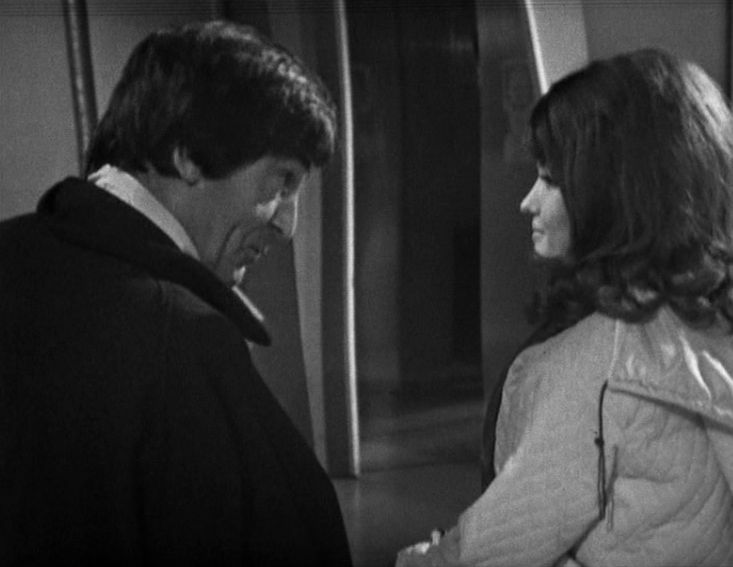 Significant in seeing our first companion exit, with Susan (Carole Anne-Ford) departing. The mold of this show can and will be broken. Significant as above, this time for the arrival of first new crew member, Maureen O'Brien's criminally underrated Vicki. Nifty enough tale in and of itself but also significant for the behind the scenes departure of David Whitaker as Script Editor. Outstanding. 'Who' nails the humour take. Joyous. The Monk. The Monk's TARDIS. The Doctor is not alone. The TARDIS is not home grown. Significant in terms of being our first pseudo-historical, a trope that'll serve 'Who' well over the years. 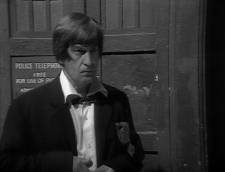 But absolutely game changing in the introduction of the Monk and his TARDIS. I guess kinda' significant for being our first out and out uber-epic (with Doctor-less prologue 'Mission to the Unknown'). 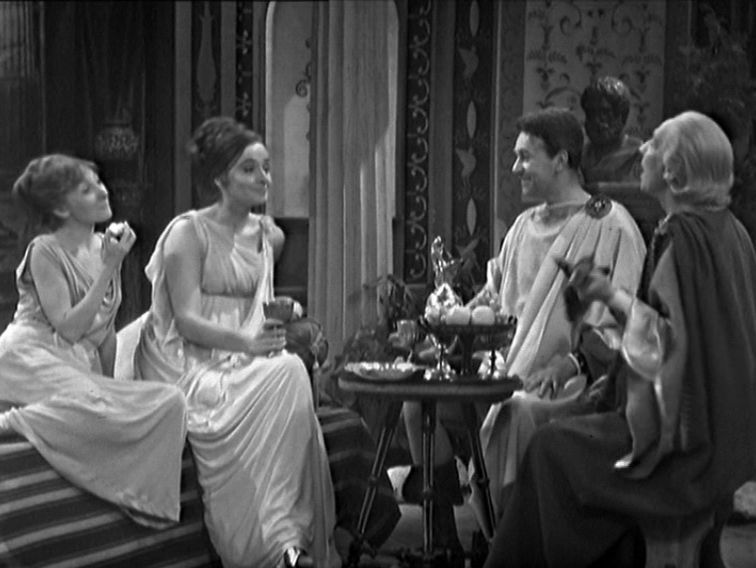 But chargedly significant for showing that companions/close associates of the Doctor ( Katarina, Brett, Sarah) can die very abruptly. Significant and game changing if maybe not quite outstanding. 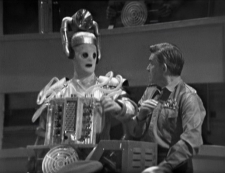 Significant for the introduction of the Cybermen and game changing in the loss of William Hartnell and establishing the (as yet unnamed) ability to regenerate. So yeah, an opening era that establishes the core cast is ever mutable, up to and including lead character. Introduces two uber-significant foes and sketches in some background for our main time traveller but keeps it deliberately very sketchy. And also quite ruthless with support cast on occasion, there really ain't no safety net at present...in three words, old but bold gold. Ooh yerse indeed. 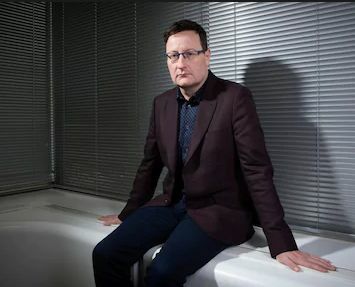 Yes indeed, wheretofore now Mr Chibnall? It's all over fer now, bar the shouting.....And f'sure there's gonna' be continued disgruntlement and chuntering from some quarters, 'twas ever thus Reverend. I think Chibnall and team have pretty much delivered on what they intended to do: Diverse core cast reflecting diverse modernity, stopping for some recent examples of discrimination vs diversity with the like of 'Rosa' and 'Demons of the Punjab'. Pretty major thumbs up from meself'n'all. Really don't get the accusations of 'OTT PC SJW' aimed at Chibnall and Whittaker. Think Whittaker could've unintentionally (or possibly deliberately ) come out with a couple of comments that'd be a red rag to some, the 'white male gaze' moment fer instance but really people, deal with it. No biggie. 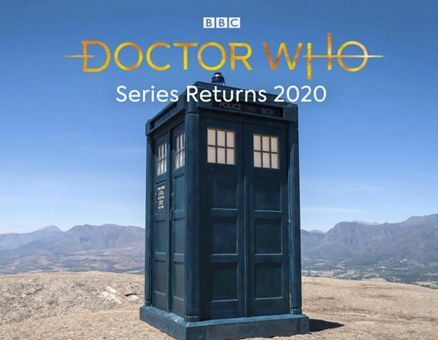 A) A kind of nagging, high chance sense (say 75%) of Series 12 being Whittaker and Chibnall's last, an announcement that things are on hiatus once again. B) 25% things are continuing, under a new head honcho and Doc' 14 for 2021. D) 5% it's rested to 2023 and the 60th when it's relaunched with an unlikely high profile Doc' 14 (Helen Mirren, Idris Elba, Hugh Grant territory) for a short series of film length specials. E) 1% it really goes to cobblers over 2019, everything falls apart and we don't even see a Series 12- looong fallow period again. 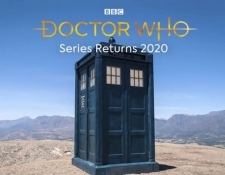 F) This whole exercise remains meaningless, 'cos Series 12 is coming but unbroadcast as of April 2020! Powered By FC2 Blog. copyright © 2019 November 32nd - Doctor Who Reviews all rights reserved. Loving the Who from a very early age and invariably banging on about it. Hence the blog. 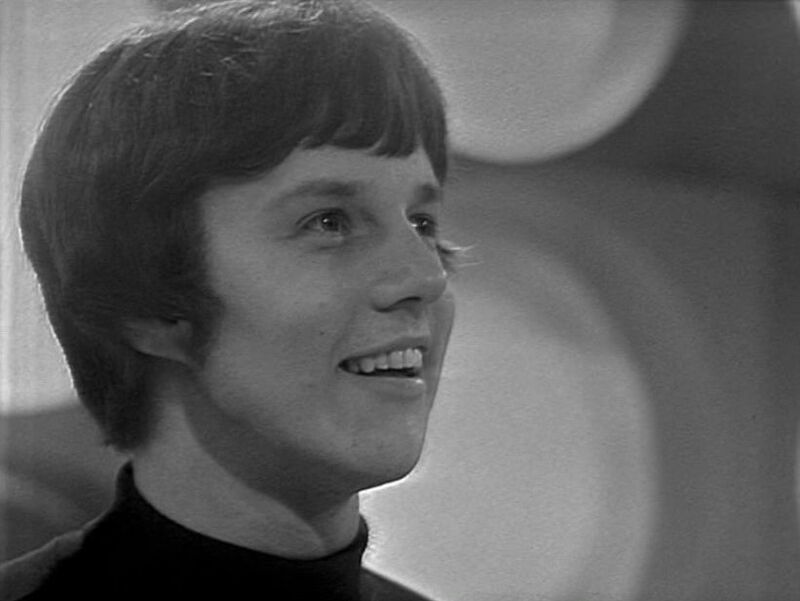 Doctor Who is copyright © British Broadcasting Corporation (BBC). All photos and other media are used for entertainment and review purposes only, there is no financial gain made from this blog.